Anne Langton (1804–1896) arrived in Upper Canada in 1837 forty years after Elizabeth Simcoe and her husband John Graves Simcoe had left. Much had changed since Elizabeth Simcoe had put her sketch book aside and returned to England. 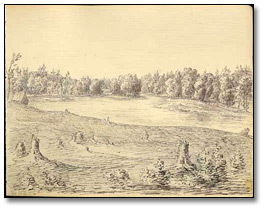 The war of 1812 had come and gone, Upper Canada’s population (374,000) was growing and land was increasingly being cleared for new communities. 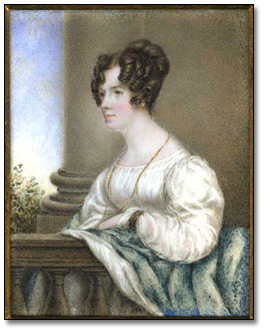 Langton lived in Canada for most of the rest of her life, though she made a few extended visits to Britain in mid and later life. Wherever she went she continued to create her art. This virtual exhibit details her life and explores the full range of her work. It will be a valuable resource for those interested in early Canadian art, social history or for those who enjoy a fascinating story. In July 2006, the Archives purchased two new watercolour portraits on ivory by Anne Langton. And in December 2006 a third new one was added to the collection. They nicely augment the 2003 donation by Patrick Garland (godson of the late Michael Langton of London, England) and can be seen in the section titled, “Miniatures on Ivory.” The earlier donation of ten Langton family portraits on ivory, the majority painted by Anne Langton, provides an opportunity to highlight the significance of the visual materials in the Langton Family Collection (F 1077). Anne Langton is best known for a posthumously published edition of her letters and journals, A Gentlewoman in Upper Canada (1950), edited by Hugh Hornby Langton, one of her nephews. Ms Barbara Williams who used the Archives extensively while researching material for her book on the life of Anne Langton and her art has curated this exhibit. Ms Williams has written the text, selected visual images from the Archives' holdings and read the quotations to bring Anne and her talent as an artist to life. The text of this exhibit may only be reproduced with permission of the author. 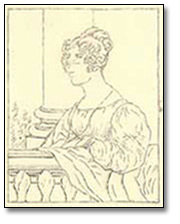 Barbara's book - A Gentlewoman in Upper Canada: The Journals, Letters and Art of Anne Langton - was published by the University of Toronto Press in 2008.